There was a full page ad on the back of my newspaper on Monday. I’m sure that page doesn’t come cheap for advertisers because most of the time it features scantily clad young ladies and short punchy stories of the kind normally associated with British tabloids like The Sun and The Daily Mail. Well whatever you think of those journalistic techniques, they sell newspapers – The Sun and The Mail being respectively No. 1 and No. 2 in the United Kingdom for daily circulation. We are a nation addicted to food and to satisfying our taste buds. We make and eat the most delicious food. We love to eat and to feed others. So in 2002 we took to the road. We wanted to ensure that no one in the world should remain ignorant of the name and taste of Turkey’s irresistible delight, the simit. 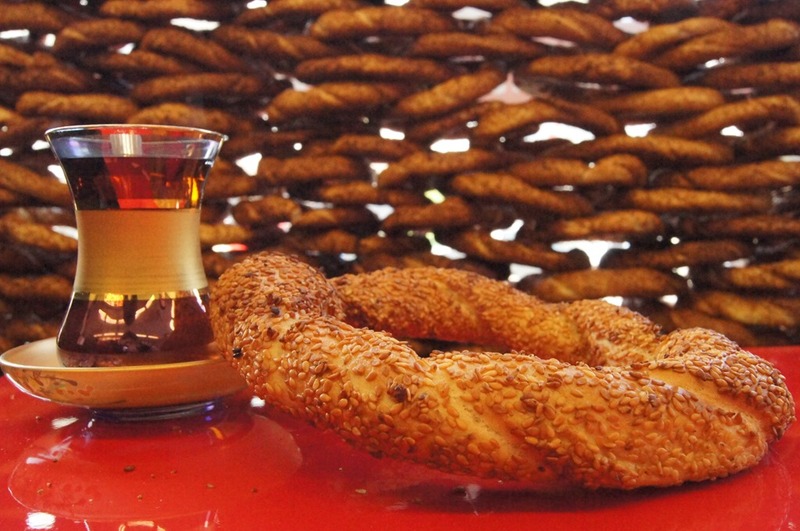 We opened the first Simit Sarayı in Istanbul’s Mecidiyeköy district. At all hours, morning noon and evening, we brought piping hot simits from our oven and served them to our customers. With, of course, the indispensible accompaniment of Turkish tea. We won the loyal support of our customers, and we thank them for it. In a short time we opened branches all over Turkey. From east to west and north to south we welcomed customers throughout our land. Before long we ventured abroad, opening branches in all corners of the globe. From Holland to Saudi Arabia we presented our taste sensations. As if that was not enough, we crossed the oceans to other continents. And today, on 9 November 2014, we realized our long-cherished dream. without changing our name or our taste. We wanted this unique flavour of Turkey to be known in its true identity. Turkey’s Simit Sarayı is now a world brand. This entry was posted in International affairs, treasures of Turkey, Turkish culture and tagged Turkish cuisine. Bookmark the permalink. LOL, the promo is effective!